Since early 2002 there is a cooperation agreement between the CORMET company based in Finland and IPS. The agreement states that IPS provides the products of CORMET in the german speaking countries, that is Germany, Austria and the german speaking Switzerland. Thereby IPS takes the first contact and the clarification of the task. The preparation of a specific quotation and the order transaction is taken directly by CORMET. For many years CORMET is working in the section of high temperature research. The following picture shows a smaller tension / tensile testing machine that is characterized especially by the ease of use. In connection with a corrosion measuring cell, a potentiostat and the corresponding software it is very easy to initiate and analyze stress corrosion cracking. 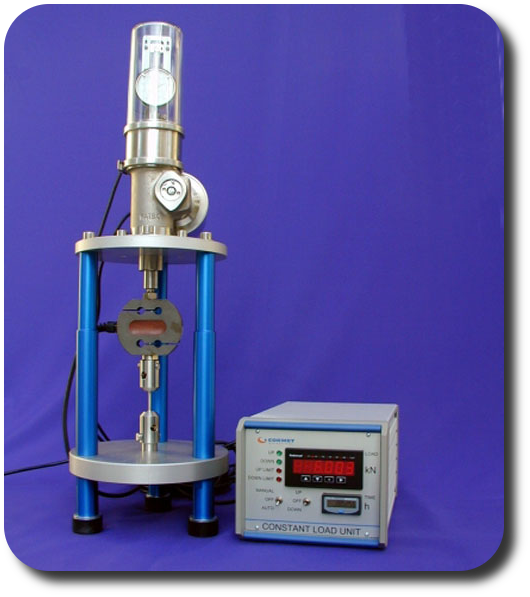 Furthermore the machine is applicable for different tension / tensile tests with different materials.